According to an article from the online journal, Accident Analysis & Prevention, from 2006 to 2015, approximately 2.2 million children from age five to 17 were treated in emergency departments for bicycle-related injuries, which is an average of about 600 injuries per day in the United States. While we all want our kids to have fun and be active, biking can be dangerous for young, inexperienced bike riders. As parents, we have to do what we can to teach our kids how to bike safely, and we need to know what to do in the event of a bike accident. As your children become more knowledgeable about and experienced with road rules and bike etiquette, you may be able to loosen the reins a bit and allow them the freedom to ride unsupervised. 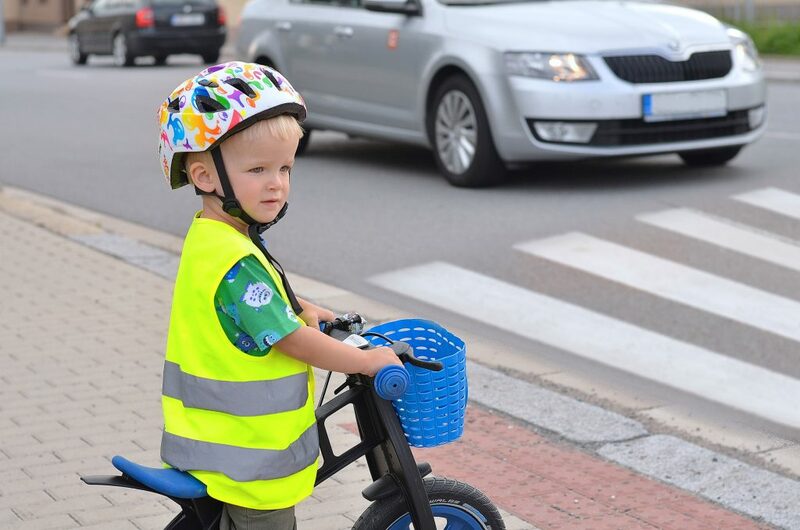 But in your children’s early stages of riding a bike, you must be diligent in teaching them how to properly and safely ride their bikes and how to co-exist on roads with people in cars and on foot. In the unfortunate event of a bike accident, adults must know what to do to ensure you’re not left with medical bills from your child’s bike accident due to someone else’s negligence. Just as with car accidents, there are certain steps you should take following a bike accident involving a child. With these accidents, it’s imperative that you do the right thing because a child is involved and will most likely not know what to do. You will likely not be present at the time of your child’s bike accident, but if you are, it is up to you to calmly call 911 and briefly describe to the dispatcher what occurred. Regardless of who calls 911, once medical help arrives, it’s important that your child be examined at the scene even if no obvious injuries are detected. Bike accidents often result in soft tissue injuries that are not visible to the naked eye and can only be diagnosed with x-rays, CT scans, or MRI’s. If your child does not receive medical attention at the scene, take your child to a doctor within 24 hours of the accident. If symptoms arise at a later time, it will be very difficult to attribute those symptoms to an injury that occurred due to the accident if there’s no medical documentation of injuries. Collect as much information at the scene as possible. Taking photos and videos of the accident scene including the surrounding area is necessary to illustrate what happened. Include photos and videos of any cars, people, and property involved in the accident, and record information about the lighting, weather conditions, traffic issues, etc. This information will be invaluable to your personal injury attorney and will provide an accurate picture of what contributed to or caused your child’s accident and injuries. Get contact and insurance information from others involved. Get the names and phone numbers of anyone involved in the accident and also anyone who may have witnessed the accident. You may want to snap a pic of everyone’s insurance information as that’s much quicker than writing everything down. If your child is seriously injured and you go straight to the hospital, this information can be retrieved from the police report, but if at all possible, ask a friend or family member who may have been close by to help you get this information. Keep any physical evidence from the accident. Gather your child’s helmet and bicycle, and do not get the bike fixed. Just store it in a safe place until you receive instructions from your lawyer about what to do with it. One of the worst things you could do following a bike accident is throw away or repair any evidence that will prove what happened to your child. Call your insurance company but only provide them the basic facts of the accident. Do not go into great detail and do not accept any type of settlement before meeting with a personal injury attorney. Contact a personal injury lawyer and schedule a consultation. If your child comes home and reports that he was in a bike accident, some of the above steps will not apply but many will. You should first check your child for injuries and go see a doctor as soon as possible in the first 24 hours following the accident. Keep all medical records and receipts of any expenses incurred due to the bike accident. Contact the police to file a report and call your insurance company to report the accident.